For those of you who played Super Mario 3D World you'll instantly recognize the gameplay formula since it is basically the same as the Captain Toad stages in the game. Though the formula has been tweaked and refined. You can now pick objects up and interact with characters. There are also some new power-ups such as the Super Pick that allows you to break blocks and defeat enemies. The game has an even mixture of platforming and puzzle elements that blend together harmoniously. The game has over 80 stages and will likely take 15-20 hours to complete in its entirety. The controls are easy to learn and feel very smooth. Every stage also possesses a set challenge to complete and doing so will count towards the completion of the game. Captain Toad: Treasure Tracker is also extremely challenging and will really test your reflexes! The graphics look decidedly cute while the detail of the stages are absolutely breathtaking. The story cut-scenes also look quite impressive and are often very humorous. The character models are also highly polished and detailed, much more than in the Captain Toad stages in Super Mario 3D World! The music is also incredible in this game with tons of variety and almost all of it fits the mood of the game! 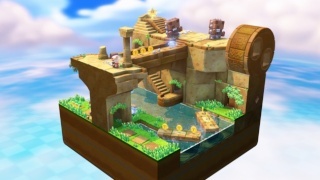 All-in-all the audio-visual presentation of Captain Toad: Treasure Tracker is flawless! With superb gameplay that is both challenging and fun, a ton of stages that provide plenty of content, excellent controls, and a nearly flawless audio-visual presentation Captain Toad: Treasure Tracker is a game that no Wii U owner should hold off purchasing! Captain Toad is surprisingly good lol. Meh. This game is overrated. @FM_Alchemist wrote: Meh. This game is overrated. I agree, but it's still a worthwhile game. So how does amiibo work in this title? GamerZack87 wrote: So how does amiibo work in this title? 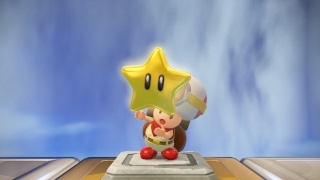 It doesn't yet, but in the future if you scan toad a hidden 2-D toad will be hidden in the stages for you to find. This game is great, can't recommend it enough! I completely agree with the review. I just got the Toad Amiibo! Do you guys want me to update my review based on the new features that the Amiibo adds to the game? @Ichigofan I thought that you were gonna tweak your review to talk about the toad amiibo features? Captain Toad isn't my favorite Mario spin-off, but it's still good, although I wouldn't give it more than an 8 if I were reviewing the game.